Where does a genealogist look for the holiday spirit — the Christmas spirit — in these last frantic days before we all rush off to try to make more family memories? How about … in genealogical records? I discovered that in 1790, there were three Holidays in the United States — and 13 Christmases. In 1800, there were five Holidays and 11 Christmases. In 1810, there were 17 Holidays and 15 Christmases. 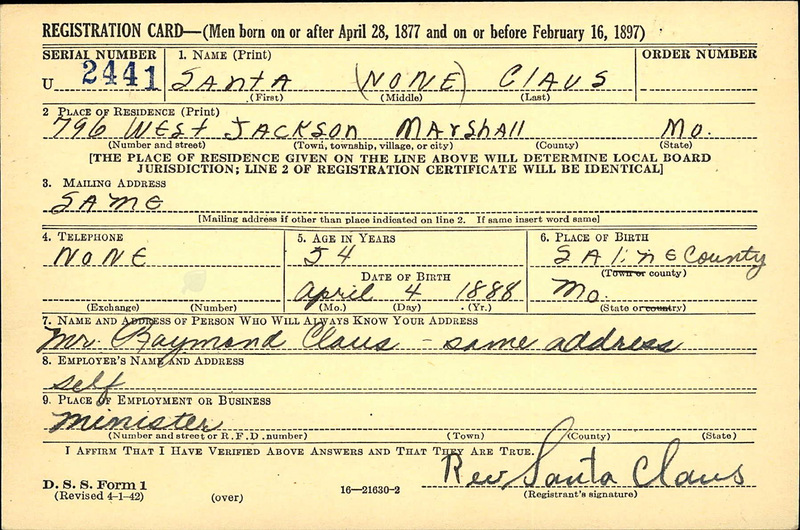 Oh, and Santa Claus registered for the draft — the Old Man’s Draft, of course — in 1942. In Missouri. Now come on … admit it … this is fun stuff. But I have to admit, the image you see here is my favorite find of the day. And the best part of the draft registration? I sincerely hope it was a minister of good cheer. Which is what you should be feeling right now. Enjoyed the blog. 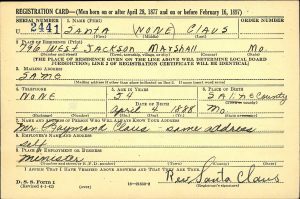 Yesterday, on a whim, I googled “Santa Claus genealogy” and found some fun stuff. And now, after reading your blog, I had a vague memory of several years ago writing about someone named “Christmas.” I just looked back — it was an article I wrote on double-enumerations in the Census (NGS Magazine, 36:4, October 2010). The 1860 listed A. G. McKenzie’s wife as “Christmas.” Further research revealed that Christmas was her maiden name. I knew the Christmases in Waukegan, IL when I was growing up. Their daughter is a FB friend now. Fun! That was indeed fun, Judy! Thanks for sharing! There is also a slightly different use of Christmas in a personal name: “Davignon, Noel, b. 20 Feb. 1810, Chambly, became a naturalized citizen of the U.S., 13 May 1840 at Saranac NY, under the name of Christmas Devenno,” p. 69,from “Davignon, The First Five Generations,” by Ronald J. Wroblewski, c. 1988. From Noel to Christmas… wow. Thanks, Judy – this was great! It will be fun to share in the Holley family on Christmas Day – fully cited, of course :-). Have wonderful holidays and thanks for your terrific blog. Thanks for the kind words — and happy holidays to you and yours!